Context: In developing countries, where money set aside for public health is <1% of the gross domestic product, routine use of surgical gloves for examining patients as well as for minor surgical procedures can be a drain on the resources. The present study was, therefore, planned to ascertain whether it is necessary to use surgical gloves in routine minor surgical procedures. Aim: The aim of the study was to ascertain whether it is necessary to use surgical gloves in routine minor surgical procedures. Materials and Methods: A comparative, prospective, randomized, double-blind study was carried out in 100 patients for various minor surgical procedures, performed aseptically. Microbiology specimens were taken from the glove's surfaces according to a standard protocol. An independent assessor, who was blinded for the procedure, examined the patients on the 7th postoperative day. Statistical Analysis Used: Statistical analysis was done using IBM SPSS Statistics 20 core system software. Paired t-test, unpaired t–test, and Karl Pearson's coefficient test were used to calculate the scientific data and association between variables. Results: A total of 100 patients who underwent minor surgical procedures were obtained at the end of the study. Paired t-test showed highly significant difference from pre- to post-operative colony-forming units at 1% level of significance (P < 0.01). Conclusions: The present study concluded that the use of surgical gloves does not offer a definite advantage in minimizing the rate of infections following various minor surgical procedures. Gloves were first introduced into the surgical arena in the 1890s. William Halstead, MD, commissioned the Goodyear Rubber Company to make the first pairs of rubber gloves to protect the hands of nurses and surgical assistants from the harsh disinfecting agent carbolic acid. The gloves were crude and cumbersome although they provided a sound means of protection against this and other harsh chemicals. It soon became apparent that wearing the gloves, also, reduced the rate of postoperative infections among patients and a subsequent decreased mortality. By the early 1900s, the use of rubber surgical gloves had become routine in operating rooms (ORs) in both Europe and the US. In the 80s, health-care practices began to change as concerns about HIV and hepatitis increased. With the proliferation of these diseases, the Centers for Disease Control and Prevention (CDC) instituted universal precautions, now, called the standard and universally accepted precautions in the late 80s. The Occupational Safety and Health Administration (OSHA) published its blood-borne pathogen standard in 1992 which required the use of gloves as a method to protect the health-care workers when contact with blood and/or other body fluids was anticipated. As pathogens have evolved, so, has the concern regarding the microbial resistance which has led many operating room personnel to begin to think more about the gloves they use. Infection rates in medical as well as surgical wards came down drastically after the observations of Joseph Lister (1860) that aseptic techniques such as washing hands before as well as after examining patients were followed in many hospitals in the late 1800s. By the 70s of the last century, wearing of surgical gloves became mandatory in many developed countries even for examining patients. By the 90s, surgical gloves were the norm in many countries including developing ones. Surgical gloves are normally worn for surgical procedures to maintain sterility during the procedure to minimize postsurgical infections. The American CDC guidelines, however, later stipulated that examination gloves are appropriate for examination and nonsurgical procedures and surgical gloves for surgical procedures. In developing countries, where the money set aside for public health is <1% of the gross domestic product (GDP), routine use of surgical gloves for examining patients as well as for minor surgical procedures can be a drain on the resources., Recently, there have been studies from developing as well as developed countries questioning the routine use of surgical gloves for such indications but none from the subcontinent. The present study was, therefore, planned to ascertain whether it is necessary to use surgical gloves during various minor surgical procedures. A comparative, prospective, randomized, double-blind study was carried out in 100 patients for various minor surgical procedures between May 2012 and March 2013. The study received ethical clearance from the Institution's Ethics Board. Inclusion criteria included patients above 18 years of age who required various minor surgical procedures and who were not suffering from any systemic illness and were not immunocompromised. Exclusion criteria included the presence of medical conditions such as uncontrolled diabetes mellitus and hemorrhagic diseases, patients on steroid therapy, and patients who were not willing to participate in the study. Patients who needed antibiotic therapy preoperatively, postoperatively or consumed them within the last month and with a history of radiotherapy to the head and neck region were excluded from the study. A written informed consent was obtained from each patient willing to participate in the study. Random allocation of groups was done using computer-generated randomization process to two groups. Various minor surgical procedures were performed aseptically under local and regional anesthesia as per the requirement of the site and the intensity of the anesthesia required (2% lignocaine with adrenaline 1:200,000). 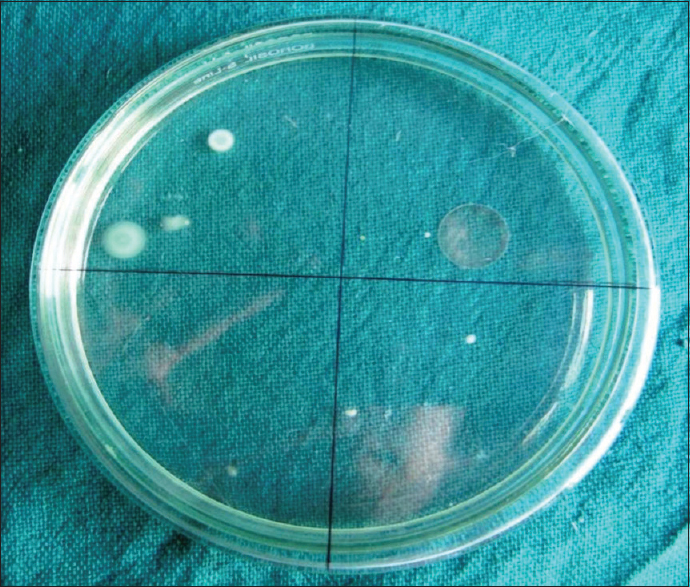 Microbiology specimens were taken from the glove's surfaces according to a standard protocol as follows: 20 ml of normal saline was used for collection of samples from glove's surface before and after the procedure [Figure 1]. 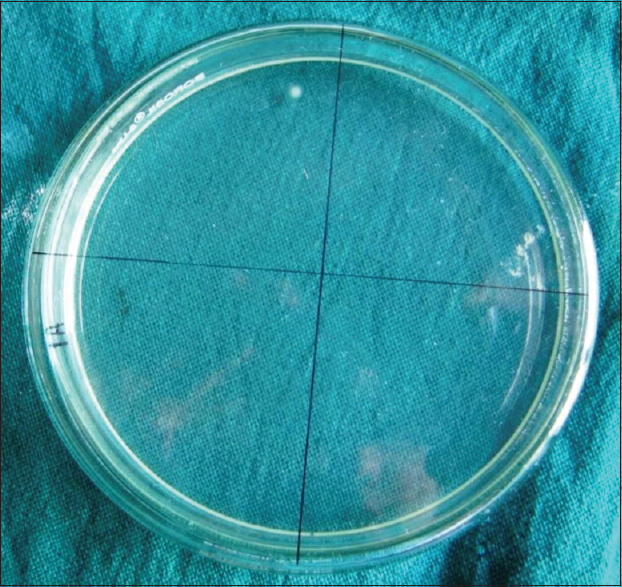 One milliliter of sample was uniformly spread on trypticase soy agar and was diluted till 1/10,000 dilution [Figure 2]. 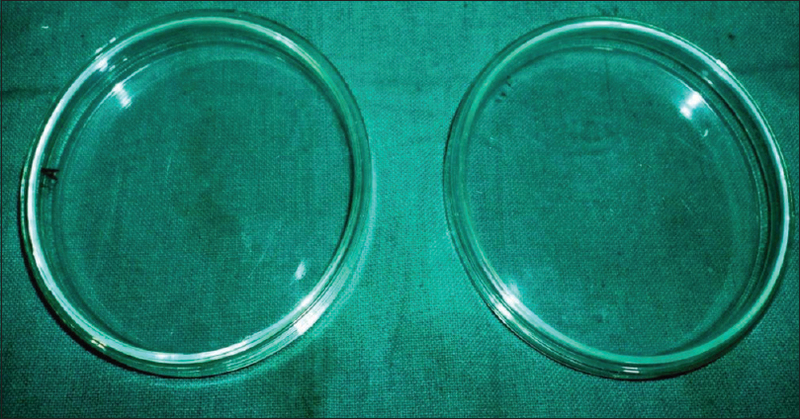 These samples were incubated at 36°C–38°C for 24 h and were observed for the colony-forming units (CFUs) both in case of pre- as well as the post-operative samples [Figure 3] and [Figure 4]. Similar postoperative instructions were given to all the patients, and no other medications were prescribed except anti-inflammatory drugs (ibuprofen 400 mg tid) postoperatively. Patients were, also, instructed not to seek any medical help elsewhere for postoperative problems, if any, and report back, if the need arises. Patients were followed up on the 7th postoperative day for suture removal and assessment of the surgical wound. Postoperatively, assessment of the surgical wound was based on exudate, odor, and condition of surrounding skin and mucosa (normal, edematous, and erythematous), pain (duration and intensity), swelling, fever (due to infection), and other signs of secondary infection. An independent assessor with no knowledge of which type of gloves were used for the procedures examined the patient on the 7th postoperative day and also for the microbiological specimens. Statistical analysis was done using IBM SPSS statistics 20 Core system software (Chicago, USA). Paired t-test, unpaired t–test, and Karl Pearson's coefficient test were used to calculate the scientific data and association between variables. P =0.05 or less was considered statistically significant while P = 0.001 or less was considered statistically highly significant. A total of 100 patients who underwent various minor surgical procedures were obtained at the end of the study. [Table 1] shows intergroup comparison of pre- and post-operative bacterial counts (CFUs) after 24 h with paired t-test showing highly significant difference from pre- to post-operative CFUs at 1% level of significance (P < 0.01). [Table 2] shows the intergroup comparison of bacterial colonies using unpaired t-test which was statistically insignificant for all. Karl Pearson's coefficient revealed a strongly positive and significant correlation (P < 0.01) in postoperative CFUs but a weakly positive correlation in the preoperative CFUs which was again found to be statistically insignificant. The drop-out rate of the patients who did not report for the follow-up was only 9%. Nosocomial (hospital-acquired) infections (NIs) are an ongoing problem in health-care facilities worldwide with an estimated 5%–10% of hospitalized patients acquiring a NI during admission. When gloves are misused, they can significantly increase the horizontal spread of pathogens. Girou et al. have described gloves acting as a “second skin” when worn for prolonged periods of time without changing, enabling the spread of NI pathogens not only to the patient but also to the surrounding environment as well. Previous investigations in intensive care settings have identified pathogens on nonsterile disposable gloves (NSDGs), also, recognized as examination gloves before use; however, whether pathogens exist on NSDGs in the context of a large hospital ward remains unexplored., It remains unclear whether pathogen levels detected represent a direct threat to human health; however, numerous studies have indicated that the infectious dose for some pathogens is significantly low, especially, when a patient is immunocompromised., Kaiser et al. recorded a level of <10 CFUs for Staphylococcus aureus in an animal model of surgical wound infection suggesting that even very low levels of glove contamination could be significant if the bacterial contaminant is a virulent strain. Other factors such as the virulence of the strain, the route of infection, and whether the bacteria were scattered over the surface of the glove or clumped in an area that was likely to come into contact with a vulnerable part of the patient, also, need to be taken into consideration and might be important in determining an overall likelihood of transmission of infection. These factors have not yet been examined in a clinical setting. The presence of the identified bacteria indicates that there is potential for even the unused NSDGs to act as transmission vehicles for these organisms., Furthermore, Zinner has shown that certain boxed gloves have increased number of defects leading to leaks and breakdowns of the protective barrier although numerous others have demonstrated a compatible quality and safety profile of sterile versus clean NSDGs in terms of physical integrity and bacteriologic contamination.,, Previous investigations have shown that damp boxed gloves might be predisposed to containing Aspergillus fumigatus. Therefore, if regular use of nonsterilized boxed gloves was to be considered, it would be important to avoid the use of those boxes of gloves that have become damp. The American Society for Testing and Material (ASTM), previously known as the ASTM, has set the standards for the manufacture of latex and synthetic gloves to include standards for sterility, freedom from holes, physical dimensions, physical properties, powder-free residue, protein content, amount of powder, and antigenic protein content. The US Food and Drug Administration (FDA) and OSHA enforce these standards ensuring that all manufacturers adhere to them. Some of these standards are exact (e.g., freedom from holes is exactly 1.5 holes per 1000 gloves) while still others have minimum numbers that must be obtained such as the physical dimensions for gloves (e.g., length, thickness, tensile strength, elongation, and modulus). Most of the ASTM requirements are expressed in ranges and that is why gloves vary somewhat from manufacturer to manufacturer. Furthermore, to meet FDA requirements, all gloves must provide adequate barrier protection against pathogens such as HIV and hepatitis B and must fulfill the requirements of glove protection as described in OSHAs blood-borne pathogen standard. Manufacturers must submit a 510 (k) application (i.e., premarket application) to the FDA. The information in this application describes and documents the safety and efficacy of the finished medical device. If the FDA deems the device to be substantially equivalent to a legally marketed medical device that is currently approved for sale in the US, clearance is granted to market the product. Manufacturers adhering to these regulations have met the challenge of producing high-quality gloves with outstanding performance capabilities in both latex and synthetic materials for use by health-care workers around the world. Even with the improved technology for producing modern-day gloves, however, there are still factors that increase the likelihood of glove failure. These factors include mechanical stress on the glove, type of surgery performed, number of instruments used during the procedure, the wearer's role in the surgical procedure, and the length of the surgery. Numerous factors in the OR act as mechanical stressors on the glove to influence its performance (e.g., type of surgical procedure, type and number of instruments used). Using heavy, sharp instruments, (e.g., drill, reamers, and osteotomes) contributes to more frequent glove failure. One mechanical stressor is the type of the surgical procedure that is being performed. Several studies have evaluated glove perforation rates during various surgical procedures.,, These rates vary from 22% to 61% during various types of surgical procedures. According to Berguer and Heller, the highest rates (61%) were reported in orthopedic, trauma, and thoracic surgeries because surgeons in these fields deal with sharp, fractured bones or bony structures in the thoracic cage. According to Laine and Aarnio, the rate of glove perforation was 18.3% for the various procedures with the laparoscopic procedures showing a relatively lower frequency of glove perforations. Yinusa et al. identified a glove perforation rate in nearly half of orthopedic procedures studied and determined that scrubbed team members were at significant risk of exposure to patients' bodily fluids. Boney procedures have been associated with higher glove failure than soft tissue surgeries., There is a trend in the literature showing that, in any type of surgery, a greater number of instruments present on the surgical field are associated with a higher glove failure rate. Although the mechanism of glove injuries is not always clear, several practices seem to increase the number of glove perforations including retracting tissue with the fingers, using dull instruments, blindly feeling for needle placement with the tip of the finger and loading and unloading the needle holder by hand. This last practice is extremely dangerous as evidenced by glove perforation numbers from the scrub personnel. Furthermore, glove failures seem to be related to the experience of the health-care provider involved, the complexity of the instrumentation, human fatigue, and an increased permeability of the glove. Furthermore, glove performance decreases with the length of time they are worn. According to St Germaine et al., glove defects are as high as 56% for surgeries that last more than 2 h compared to 20% for the surgeries that last <2 h. A plethora of studies have shown that the incidence of glove defects increases with the duration of surgery., One such study found that the risk of glove perforation increases 1.115 times for every 10 min of surgical time. Perforations are significantly higher for emergency procedures than they are for scheduled procedures. Gloves were introduced into surgical practice for hygiene purpose more than a century ago and have been recommended for mandatory use in surgical procedures from more than three decades. The vast majority of the wounds created post-minor surgical procedures heal normally without adverse incidents over approximately six weeks. The level of glove cleanliness that may influence the postoperative infection rate in minor surgical procedures has not been properly explored. Initially, surgeons resisted wearing gloves during patient treatment possibly because of fears that manual dexterity and treatment efficiency would be adversely affected. Only 1.4% of GDP is spent on medical and dental services in India which is among the lowest in the world. The corresponding figure for the US is in excess of 7% while European nations like the UK, Spain, Germany, and Italy spend around 6.5%–8% of their GDP on health care., Budget control is a debatable topic, especially in teaching hospitals and developing countries, where private institutions are unable to get a grant from the respective governments. Compliance with the minor surgical procedures is expensive, and the use of surgical gloves during all procedures can be impracticable. Even in developed countries, budgetary constraints have encouraged surgeons to query whether the use of surgical gloves for all procedures is desirable. However, if examination gloves are found not to increase the infection rate postsurgically, the concept of clinical practice may have to be given a re-thinking. Furthermore, of interest was the fact that culture of a swab of the palm of the surgical gloves before surgery showed that 50% of the samples were already contaminated before the actual start of the procedure. In the present study, surgical as well as examination gloves used during various minor surgical procedures showed no significant difference in the risk of postoperative clinical complications in both the groups. McDaniel et al. analyzed a variety of examination gloves immediately upon opening the boxes for the presence of bacterial organisms and to reexamine the remaining gloves after the boxes were put into clinical use and concluded that new examination glove boxes were remarkably free of bacterial contamination. Berthelot et al. investigated the bacteriological contamination of examination gloves before the boxes were opened and found that a large variety of bacteria could be isolated from examination gloves. Ferreira et al. quantified the CFUs on latex procedural gloves in the beginning, middle, and end of the opening of the boxes carrying the glove containers and evaluated the microbial load of the gloves considering time of exposure to the environment. It was emphasized that the time of exposure of gloves did not cause significant contamination. Therefore, the use of examination gloves appeared to be safe from microbiological viewpoint. In the present study, surgical and examination gloves were compared pre- and post-operatively during various routine minor surgical procedures with the help of CFUs, and there was a highly significant difference between both the groups. Creamer et al. conducted a study to determine if there was a difference in bacterial CFUs on surgical versus examination gloves in an outpatient clinical setting. They came to the conclusion that there was a statistically significant difference in bacterial load on examination versus surgical gloves. However, when comparing the bacterial contamination on examination gloves with that required causing an infection as it appeared that this statistically significant difference was clinically irrelevant. The present study, also, supports the study as there was a highly significant difference from pre- to post-operative CFUs in both the groups. Although there was a statistically significant difference in bacterial load on surgical and examination gloves, it appears that this statistically significant difference is supposed to be clinically irrelevant. The present study concluded that the use of surgical gloves did not offer an advantage over examination gloves in minimizing the rate of postoperative infections following various minor surgical procedures. The present study recommends that most of the routine examination and minor surgical procedures can be safely performed by surgeons wearing examination gloves without increasing the risk of postoperative infections. Furthermore, the study paves the way for further studies with inclusion of immunocompromised patients since this set of patients is actually at a higher risk of contracting infections under any type of breaches in the aseptic protocols and with the possible usage of examination gloves. Twomey CL. Double gloving: A risk reduction strategy. Jt Comm J Qual Saf 2003;29:369-78. Korniewicz DM. Barrier protection of latex. Immunol Allergy Clin North Am 1995;15:123-36. Universal precautions for prevention of transmission of HIV and other blood-borne pathogens. Centers for Disease Control and Prevention. Available from: http://www.cdc.gov/ncidod/dhqp/bp_universal_precautions.html. [Last accessed on 2008 Dec 16]. Blood-borne pathogens – 1910.1030. US Department of Labor; Occupational Safety and Health Administration. Fed Regist. 1991;56:64004 (Codified at 29 CFR §1910.1030). Available from: http://www.osha.gov/pls/oshaweb/owadisp.show_document?p_table=STANDARDS&p_id=10051. [Last accessed on 2008 Dec 12]. Laskin DM. The selection of proper gloves for intraoral surgery. J Oral Maxillofac Surg 1999;57:887. Graves N, Nicholls TM, Morris AJ. Modeling the costs of hospital-acquired infections in New Zealand. Infect Control Hosp Epidemiol 2003;24:214-23. Girou E, Chai SH, Oppein F, Legrand P, Ducellier D, Cizeau F, et al. Misuse of gloves: The foundation for poor compliance with hand hygiene and potential for microbial transmission? J Hosp Infect 2004;57:162-9. Rossoff LJ, Lam S, Hilton E, Borenstein M, Isenberg HD. Is the use of boxed gloves in an Intensive Care Unit safe? Am J Med 1993;94:602-7. Luckey JB, Barfield RD, Eleazer PD. Bacterial count comparisons on examination gloves from freshly opened boxes versus nearly empty boxes and from examination gloves before treatment versus after dental dam isolation. J Endod 2006;32:646-8. Kaiser AB, Kernodle DS, Parker RA. Low-inoculum model of surgical wound infection. J Infect Dis 1992;166:393-9. Schmid-Hempel P, Frank SA. Pathogenesis, virulence, and infective dose. PLoS Pathog 2007;3:1372-3. Pittet D, Allegranzi B, Boyce J; World Health Organization World Alliance for Patient Safety First Global Patient Safety Challenge Core Group of Experts. The World Health Organization Guidelines on Hand Hygiene in Health Care and their consensus recommendations. Infect Control Hosp Epidemiol 2009;30:611-22. Boyce JM, Pittet D; Healthcare Infection Control Practices Advisory Committee. Society for Healthcare Epidemiology of America. Association for Professionals in Infection Control. Infectious Diseases Society of America. Hand Hygiene Task Force. Guideline for Hand Hygiene in Health-Care Settings: Recommendations of the Healthcare Infection Control Practices Advisory Committee and the HICPAC/SHEA/APIC/IDSA Hand Hygiene Task Force. Infect Control Hosp Epidemiol 2002;23 12 Suppl: S3-40. Zinner NL. How safe are your gloves? A study of protective barrier properties of gloves. AORN J 1994;59:876, 879-82. Burke FJ, Wilson NH. Non-sterile glove use: A review. Am J Dent 1989;2:255-61. Burke FJ. 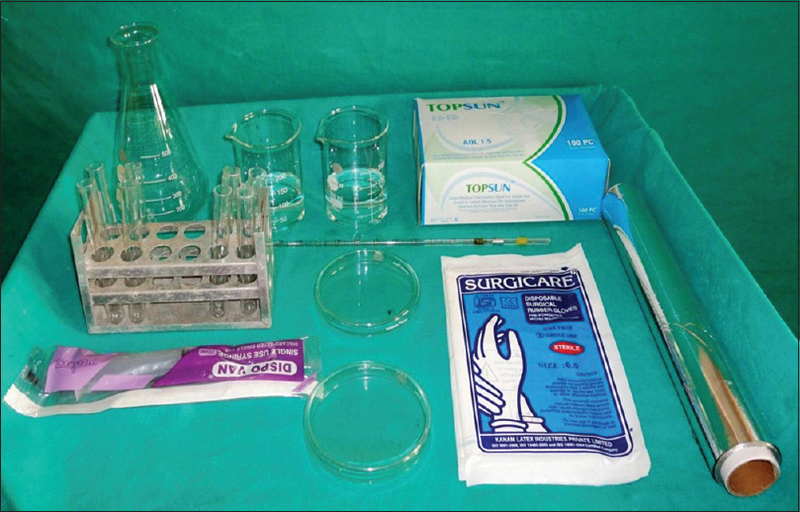 Use of non-sterile gloves in clinical practice. J Dent 1990;18:79-89. Fiehn NE, Westergaard J. Physical and microbiological quality of five different examination and surgical gloves before and after use in dental practice. Zentralbl Hyg Umweltmed 1993;195:27-36. Edwards J. Check for mould on non-sterile examination gloves. N Z Dent J 1994;90:20. ASTM International. ASTM D3577-06e1 standard specification for rubber surgical gloves. Available from: http://www.astm.org/Standards/D3577.htm. [Last accessed on 2008 Dec 19]. Pre-market notification 510(k). US Food and Drug Administration. Available from: http://www.fda.gov/CDRH/DEV ADVICE/314.html. [Last accessed on 2008 Dec 19]. Berguer R, Heller PJ. Preventing sharps injuries in the operating room. J Am Coll Surg 2004;199:462-7. Laine T, Aarnio P. How often does glove perforation occur in surgery? Comparison between single gloves and a double-gloving system. Am J Surg 2001;181:564-6. Yinusa W, Li YH, Chow W, Ho WY, Leong JC. Glove punctures in orthopaedic surgery. Int Orthop 2004;28:36-9. Hollaus PH, Lax F, Janakiev D, Wurnig PN, Pridun NS. Glove perforation rate in open lung surgery. Eur J Cardiothorac Surg 1999;15:461-4. Thanni LO, Yinusa W. Incidence of glove failure during orthopedic operations and the protective effect of double gloves. J Natl Med Assoc 2003;95:1184-8. Chapman S, Duff P. Frequency of glove perforations and subsequent blood contact in association with selected obstetric surgical procedures. Am J Obstet Gynecol 1993;168:1354-7. St Germaine RL, Hanson J, de Gara CJ. Double gloving and practice attitudes among surgeons. Am J Surg 2003;185:141-5. Amler MH. Disturbed healing of extraction wounds. J Oral Implantol 1999;25:179-84. Chiu WK, Cheung LK, Chan HC, Chow LK. A comparison of post-operative complications following wisdom tooth surgery performed with sterile or clean gloves. Int J Oral Maxillofac Surg 2006;35:174-9. McDaniel TF, Daugherty D, Wilson S. Bacterial contamination of clinical examination gloves. Gen Dent 2007;55:33-5. Berthelot P, Dietemann J, Fascia P, Ros A, Mallaval FO, Lucht F, et al. Bacterial contamination of nonsterile disposable gloves before use. Am J Infect Control 2006;34:128-30. Ferreira AM, Andrade DD, Haas VJ. Microbial contamination of procedure gloves after opening the container and during exposure in the environment. Rev Esc Enferm USP 2011;45:745-50. Creamer J, Davis K, Rice W. Sterile gloves: Do they make a difference? Am J Surg 2012;204:976-9.